Enterprise Ireland’s R&D Core Unit is hosting a number of regional roadshow events throughout the country on their new Agile Innovation, Research and Development funding programmes. Offering fast-track approval and a streamlined online application process, the new Agile Innovation Fund allows companies to access up to 50% in support for product, process or service development projects with a total cost of up to €300,000. The funding is ideal for Irish companies that need to rapidly develop solutions or are planning a first R&D project and open to eligible Enterprise Ireland client companies. The process has been streamlined for eligible companies with a short online application and fast-track approval. Please contact your Development Adviser before applying. The Agile fund is part of Enterprise Ireland’s wider Innovation Offer, which includes funding and supports for collaborative research, increasing the innovation capability of companies and funding for large R&D projects. 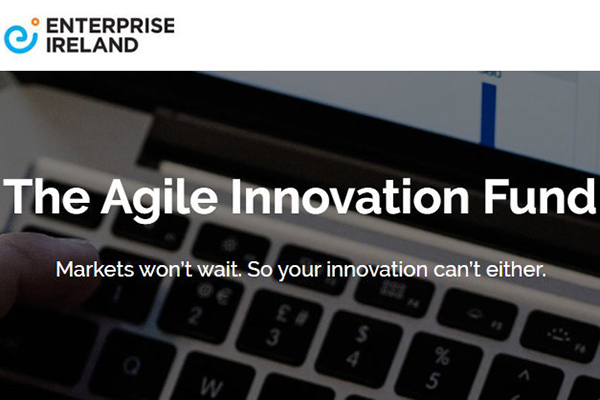 You can find more information on the Agile Innovation Fund plus registration details here. You can also follow them on Twitter for all the latest news and events.